This Sport model Woodsman is unusual in two ways: it's one of the so-called "Postwar/Prewar" guns, and it is a full King Conversion. 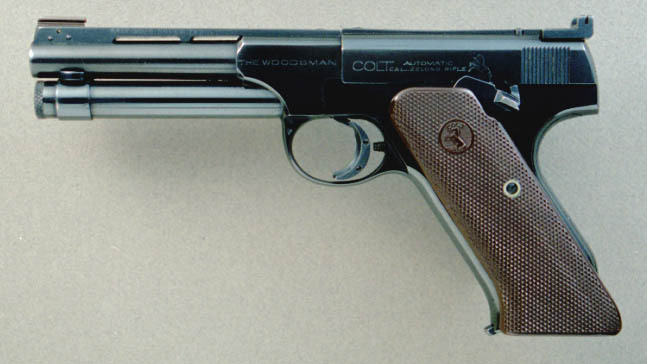 In 1946-47, while retooling for postwar production, Colt assembled as many guns as they could from leftover pre-WWII parts, most of them, including this one, with extended plastic stocks left over from the wartime Match Target production. This Woodsman was later shipped to the King Gunsight Company of San Francisco where it was given the full treatment with ventilated rib, weight tube, trigger shoe and trigger stop, King sights, and an action job.